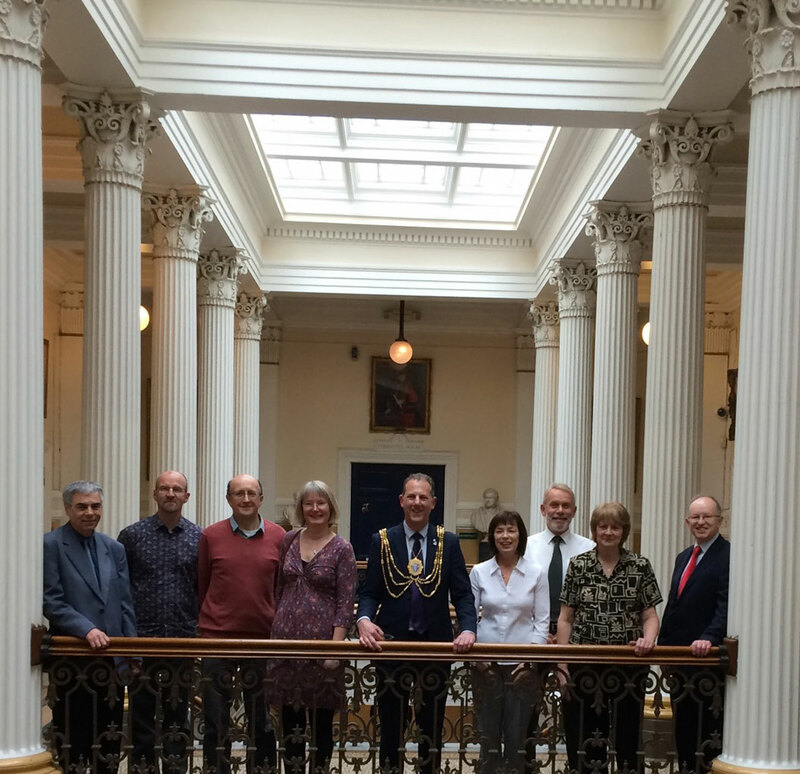 On 29th March a team from the Friends of Three Cornered Copse visited the Town Hall to have tea with Cllr Pete West, our current mayor. Led by our chairperson, Ruth, we were invited to receive the gratitude of the council for the volunteer hours we have spent clearing and caring for Three Cornered Copse over the past years. It was a delightful afternoon; Cllr West turns out to be quite a character, and after tea and cakes, he showed the team around the Town Hall, explaining the history of the Mayor's office, the chains of office and the paintings decorating the Mayor's parlour. The Mayor is also passionate about his charities, and is raising money with cycling and walking around the city this spring. (For details look at Facebook for BHMayor.) We discussed how the group was formed, and our aims and our planned work. It proved to be a lovely couple of hours, and so pleasing to receive some recognition for the hard work that our volunteers have done. Visitors to the copse recently will have noticed the new furniture we have installed on the edge of the green. A perch bench made by our park ranger Garry arrived at our work day last month to replace the vandalised version that we took away in the winter. After a couple of weeks it looks like it has been there forever, and is proving popular as a meeting place for walkers and their dogs. A big 'thank you' to Garry for spending the time making this. Let's hope it proves more vandal proof than its predecessor. The bluebells are appearing in the copse as the warm spring air blows through the trees. There is a fair proportion of both the native bluebells and the non-native (Spanish) bluebells. Sometimes hard to distinguish, the native version are usually a paler blue, with white pollen (not blue), and narrow bell-shaped flowers with rolled back tips. The non-natives have broader leaves and upright stems. To confuse matters, there are also hybrids formed as the Spanish bluebells compete in the same woodlands. Our Victorian ancestors introduced the Spanish variety to decorate their gardens, and they have spread as the garden rubbish has found itself into urban woodlands such as Three Cornered Copse. The copse is at its best in these spring months, so please enjoy a walk through the glades and appreciate the bluebells, whichever variety you prefer.